St Philip’s is a Church of England Aided Primary School for children aged from 4 to 11 years old. 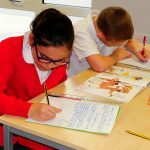 Our growing school currently has three classes per year group from Reception to Year 3, and two classes per year group from Year 4 to Year 6. The school is located in the Westbrook District of Warrington. We are extremely proud of our happy, caring and challenging school which aims to enable each and every child to achieve. Please see our Admissions Page under Parent Information if you are interested in a place for your child.